On October 31, Charge d'Affaires a.i. 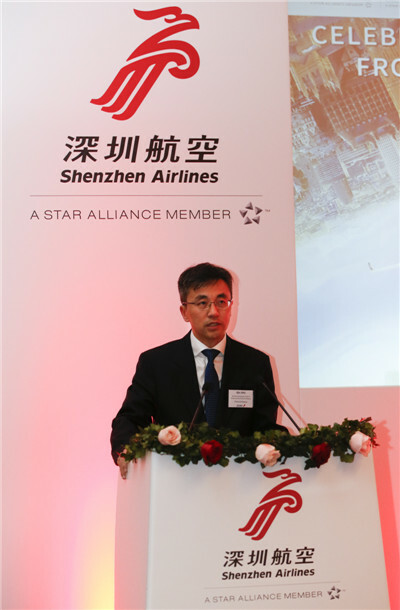 Zhu Qin attended and addressed the Shenzhen Airlines London Heathrow - Shenzhen Inaugural Flight Celebration. 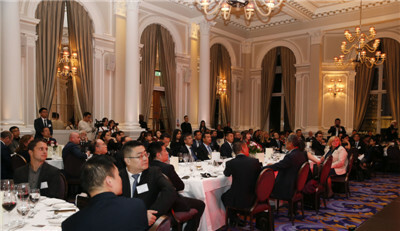 About 100 people from various sectors of China and the UK were present, including Xu Songming, Deputy Secretary-General, the People’s Government of Shenzhen Municipality, Wang Jie, Vice President of Shenzhen Airlines, Julie Chappell, Managing Director, International Markets, London and Partners, Jeffrey Goh, CEO of Star Alliance and representatives from Shenzhen City. Zhu extended his warmest congratulations on the launch of Shenzhen Airlines flight between Shenzhen and London, saying that as the first inter-continental flight of Shenzhen Airlines, its opening signifies a new takeoff in Shenzhen’s opening up and development. As China deepens reform and expands opening up, Shenzhen is once again taking the lead by seizing the opportunities of the Belt and Road Initiative and the development of the Guangdong-Hong Kong-Macau Greater Bay Area. Zhu noted that the launch of the direct flight is a new chapter in the “tale of two cities”. Both Shenzhen and London are open and innovative. They each have unique strengths that could work to the advantage of the other. The new flight route will serve to strengthen the bond between the two cities and create new opportunities for China-UK exchange and cooperation. “The opening of this new flight between Shenzhen and London will further facilitate people-to-people exchanges between China and the UK, create more opportunities for investment, and deliver more tangible benefits to the people of the two cities and our two countries”, he said. Deputy Secretary-General Xu and Vice President Wang also spoke at the event. They said that Shenzhen will actively participate in the Belt and Road Initiative and the construction of Guangdong-Hong Kong-Macau Greater Bay Area, and further deepen its economic and trade exchanges, industrial cooperation and tourism development with London. Shenzhen stands ready to contribute more to the people-to-people, economic and cultural exchanges and cooperation between China and Britain. Shenzhen Airlines, founded in 1993, is the fifth largest airline in China, with businesses covering air passenger and cargo transportation, catering, tourism and hotel service. Shenzhen Airlines has a fleet of 213 aircraft, operating nearly 300 domestic and international routes. The new route between Shenzhen and London is served by Airbus 330-300 three times a week with the flight time of 12 hours and 30 minutes.